Dzhokhar Tsarnaev was sentenced to death by a federal jury in a state that firmly repudiates capital punishment. 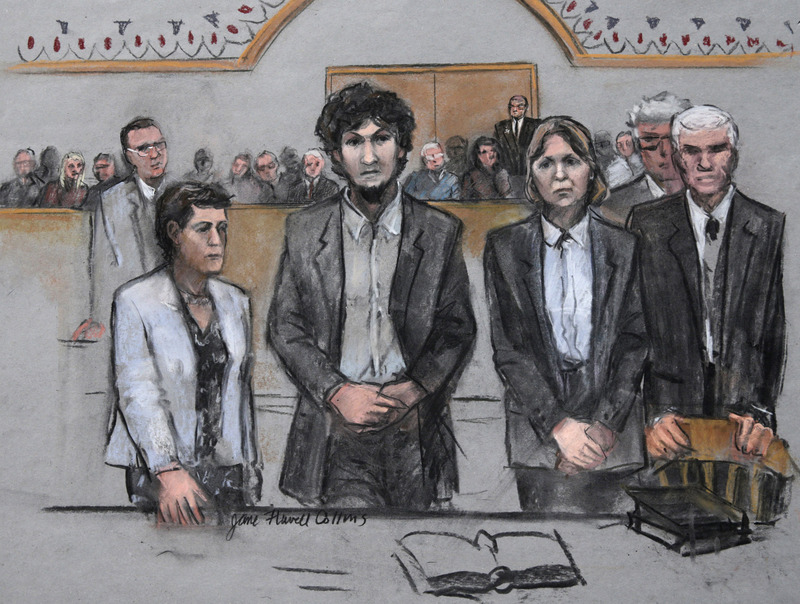 There was little surprise in a federal jury’s voting death for Boston Marathon bomber Dzhokhar Tsarnaev, and little ground for sympathy to be found in the record of the defendant himself beyond his sheer youth. While the evidence presented at trial seemed to confirm the picture of his enraged older brother Tamerlan as the radicalized instigator of their brutal and nihilistic marathon plot, Dzhokhar’s protracted and active role ahead of time, and his stone-cold activities in the hours following the bombing—calmly cruising the dairy aisle at Whole Foods—are not the material from which a strong mitigation case is made. To spare him, the jury would have had to vote against capital punishment itself; since they were “death qualified” ahead of time in the selection process this was never in the cards. But while perhaps inevitable, Tsarnaev’s federal-court death sentence is still profoundly unsettling for most Bostonians—and should be unsettling nationwide too. Tsarnaev was sentenced to death in a state that had abolished capital punishment 31 years ago; in a city whose residents had overwhelmingly preferred him to be imprisoned for life; and in a courtroom in which sat survivors and family members left bereft by the Tsarnaevs’ warped jihad who themselves were deeply divided about his fate. What does it mean that a killer is sentenced to die by lethal injection against the wishes—expressed in law, polls and the words of many survivors—of the very community he injured? What is the purpose of a federal prosecution’s imposing capital punishment on a region that wants none of it, at a moment when capital punishment has been abandoned by more than one-third of all states? State death-penalty law, for better or worse, is usually a deep reflection of local history, culture, and debate. That’s true in the states that still routinely execute prisoners—Texas, Oklahoma, and the Deep South death-penalty strongholds; those that shut their death rows decades ago, such as West Virginia and Michigan; and the nine states that have abolished capital punishment since 1980, including Massachusetts. The federal death penalty, on the other hand, is a different story: largely a recent invention, radically expanded during a few brief years of Bill Clinton’s presidency. Ever since, the federal death penalty—both in the laws passed by Congress and the cases selectively pursued by US Attorneys—has been all about politics of the most cynically expedient variety. Most relevant to the Tsarnaev case, the federal death penalty has been a convenient vehicle for Washington Republicans and Democrats alike to profit from the same terrorism panic which after 9/11 saddled us with the Patriot Act. Up until twenty years ago, the federal death penalty was limited to treason and a handful of other rare offenses not covered by state criminal laws. But in 1994, the Clinton administration—responding to the first World Trade Center bombing and otherwise hoping to burnish its tough-on-crime credentials—radically expanded capital punishment, writing terrorism in among dozens of new federal death-penalty offenses in that year’s sweeping criminal-justice reform package. It didn’t do much good; seven months after the bill was signed, Timothy McVeigh and two co-conspirators bombed the Murrah Federal Building in Oklahoma City (a tragedy whose 20th anniversary was marked during the Tsarnaev trial). So the next year, Clinton and Congress went even further, pushing through the Antiterrorism and Effective Death Penalty Act. This package—surely one of the most deceptively labeled bills of all time—limited habeas corpus and otherwise weakened the protections offered to state and federal death-row prisoners alike, most having nothing to do with terrorism, national security, or anything other than conventional murder. Between them, these two reforms gutted the federal appeals rights of conventional death-row prisoners. By putting crimes previously prosecuted by states onto the federal books, they also enabled US Attorneys to push capital trials into non–death penalty jurisdictions, occasionally leading to notable conflicts. In 2011, for instance, federal prosecutors in Rhode Island—a state without capital punishment since the eighties—insisted on pursuing capital charges against a gas-station robber who would otherwise have been tried, convicted, and sentenced in state criminal courts. Then-governor Lincoln Chafee, incensed at this imposition of a death-penalty trial on his state, committed a singular act of civil disobedience: for almost two years he refused to hand the offender over to the feds. The dispute was settled only when the robber pleaded guilty in return for life without parole. But terrorism? As far as national security is concerned, the federal death penalty has been meaningless. It did nothing to deter Oklahoma City, the 9/11 attacks, or ideologically motivated lone wolves like Nidal Malik Hassan, the Fort Hood shooter, or the Tsarnaevs. Meanwhile Khalid Sheikh Mohammed and other 9/11 conspirators won’t even be tried under the Antiterrorism and Effective Death Penalty Act, since the same politicians who clamor for the death penalty for terrorism suspects are unwilling to entrust Guantánamo prisoners to US courts. In 1994, the death penalty could at least be claimed as policy in the overwhelming majority, if not totality, of states. The Clinton administration’s promotion of capital prosecution could perhaps be defended as effective electoral politics. Now, with the death penalty abolished in 18 states, that consensus is over. Whether the federal government will even have a mechanism for eventually executing Tsarnaev is now in a matter of debate. The last time a terrorist bomber was executed was McVeigh, killed by lethal injection in Indiana in June 2001. At his execution, news reporters noted tears streaming from one otherwise immobile eye as the court-approved three-drug poison regimen pumped through his veins. Those tears caught the attention of a Columbia University anesthesiologist named Dr. Mark Heath; from operating-room experience Heath recognized it not as a sign of emotion but as a classic scientific indication that the pain-masking sedative in the federal government’s killing cocktail was wearing off, with McVeigh still paralyzed but now in unspeakable agony. From McVeigh’s teardrop and Heath’s diagnosis flowed 14 years of medical journal and law-review articles, lawsuits, and worldwide alarm about the procurement of drugs for America’s lethal injections. International pressure led drug companies to refuse to supply state corrections departments with the cocktail’s ingredients. During the Tsarnaev trial, the lethal-injection debate reached the Supreme Court, with a fractious and macabre argument among the justices over whether the injection of substitute death-row cocktails, improvised from shadowy suppliers, amount to cruel and unusual punishment. It should be clear by now that the federal death penalty, far from reflecting social consensus or meaningful deterrence, is entirely political in nature—designed to sell the capital punishment back to states that clearly rejected it, and to inoculate Democratic and Republican presidents alike in the country’s most ardently pro-execution regions. But the criminal-justice culture war has turned around. In a new libertarian wave, Congress, the president, and state legislatures are variously ratcheting down the drug war, reversing three-strikes criminal laws and trying desperately to empty overcrowded, expensive, and dangerously ill-functioning prisons. In 1994, Bill Clinton Democrats played the federal-death-penalty card to retain their hold in divided states. But since then six states, including four that today have Republican governors—New Jersey, New Mexico, Maryland, and Illinois—have since turned back from the death penalty. It’s a different time. Three of Hillary Rodham Clinton’s Democratic rivals—Chafee, Maryland’s former governor Martin O’Malley and Vermont Senator Bernie Sanders—are death-penalty opponents. Chaffee, who four years ago had taken that principled stand against federal prosecutors, and O’Malley, who as governor abolished capital punishment in Maryland, made statements of respect for the Boston jury, but made clear their determination to stay the abolitionist course. Sooner or later the federal death penalty will be a Democratic campaign issue, and Hillary Clinton will be challenged on her views.